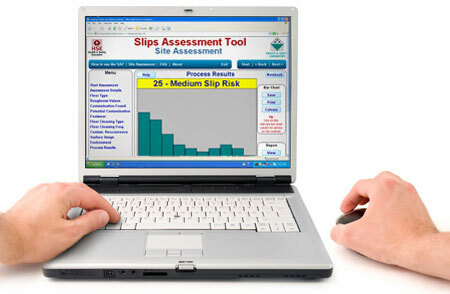 The Slips assessment tool (SAT) is a freely downloadable computer software package that allows an operator to assess the slip potential of pedestrian walkway surfaces. SAT will prompt you to gather relevant information concerning floor surface properties, contamination, cleaning regimes, footwear etc. Enter the information into a laptop computer (preloaded with the SAT software) on site for an immediate assessment of a slip risk. When all of the information is entered into SAT, a slip risk rating is produced. This will assist in determining whether site conditions are likely to give rise to a high or low risk of slipping. The assessment can be repeated using alternative data such as different cleaning regime or footwear type etc. to produce a different [theoretical] slip risk rating. This is a very powerful way of demonstrating the importance of various slip risk control measures. You can download the SAT proforma so that you can complete an assessment on site even if you do not have access to a computer. The data can then be entered into the SAT at a later date.